Put flour in a shallow bowl. In a separate bowl, whisk together the eggs. And in a third bowl, mix breadcrumbs and parmesan cheese. Begin to heat oil in a large skillet over medium heat. While the skillet is heating, begin to prepare the chicken. Dip the first chicken strip in flour and coat well, then dip into the eggs. Allow excess egg to drip off and then dip into the bread crumb mixture. Place into skillet and cook until each side is golden brown and chicken is no longer pink in the middle. Repeat this process for each chicken strip. Allow chicken to cool then cut each strip into halves or thirds. 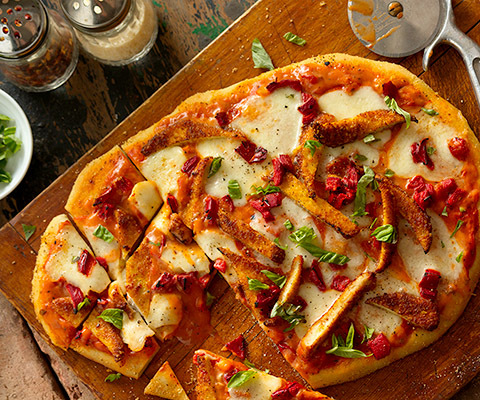 Spread the pizza dough on a baking sheet or pizza stone. 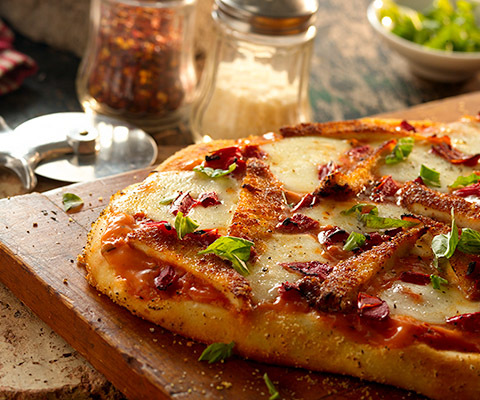 Spread Classico® Creamy Tomato and Roasted Garlic Sauce over crust, leaving about 1/2” all around the pizza that isn’t sauced. Top the pizza with the mozzarella cheese, chicken, roasted red peppers and basil. Bake for 10 – 15 minutes or until crust is golden brown and cheese is bubbling. If desired, substitute Classico Creamy Alfredo Pasta Sauce for Classico Roasted Garlic Alfredo Pasta Sauce. If desired, substitute white wine with chicken broth. I made this for my kids and they loved it!! I added some more pizzazz seasoning which made it even more deliciouso. Easy to follow recipe. especially for someone who has never made pizza before. Good idea! What a great idea! So easy and yummy!